Simplify your monthly email reporting with DashThis! It’s important to track the performance of your email marketing campaigns that you’ve painstakingly created. Our email campaign report template gets you started quickly with all the most important KPIs you need to be following. Track your open rate, CTR, conversion rate, bounce rate, subscribe rate, and more, with our email marketing report template! Understand the effectiveness of your subject line and your in-email CTAs with this historic widget, which shows both the percentage of subscribers that opened the email, as well as the percentage of those who clicked on an in-email element. Are you reaching the right audience, and is that audience growing thanks to your email campaigns? 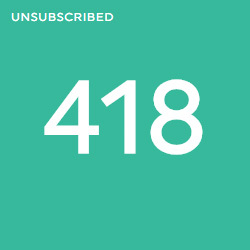 This historic widget shows the number of people who are subscribed to your mailing list. 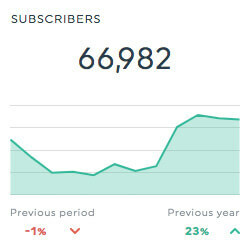 If you're wondering whether your emails are reaching the wrong types of people, this simple number widget shows the number of people who opted to unsubscribe to the mailing list they were previously subscribed to. 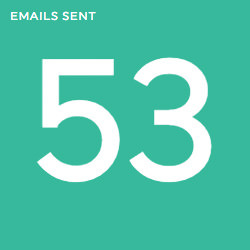 An easy way to ensure that you're active enough in the email marketing channel is to use this simple number widget, which shows the number of emails sent for a particular campaign. Want to see your own email marketing KPIs in this report? Present your results in our awesome-looking email report template! Plugging your own data from across a multitude of digital tools into our simple email report template is as easy as 1-2-3! Include your MailChimp or Campaign Monitor data, plus way more… all in the same report! Choose the email report template from the drop-down menu, and you’re all set! Centralize your email marketing data sources! If MailChimp or Campaign Monitor isn’t enough for you, our system also connects with Google Analytics, Facebook Insights, Google AdWords, and way more! 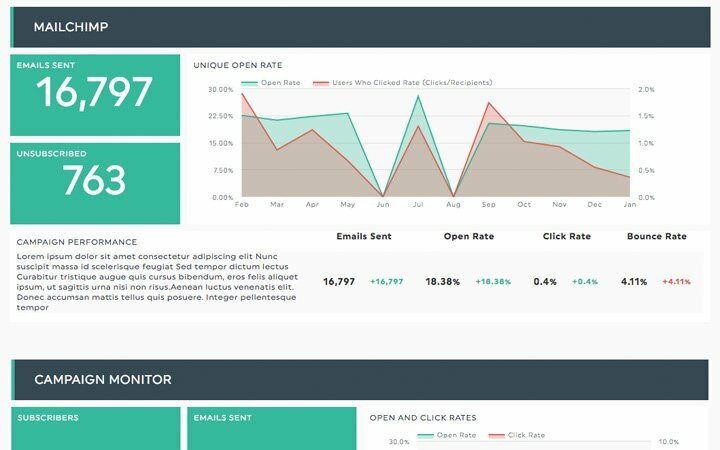 Display your own data with an awesome email report template! Customize your email marketing report template with the features that agencies and marketers like you need! Explore our KPI Reporting Tool! Need to add other data than what’s in your connected email platforms? With our CSV file manager, you can include ALL your data into the same report! Your account can be shared with all of your colleagues, so that you’re all on the same page when it comes to your email marketing reports. Give your client what they need with an email marketing report that fits their brand with a custom URL, a custom design, or even both! No matter what kind of email campaign report you’re creating, DashThis makes it simple! See the performance of your email campaigns displayed in a nice, user-friendly email marketing report. Gather your Campaign Monitor email campaigns’ data and get a clear idea of your performance in a dedicated report. DashThis offers a multitude of marketing templates you can use to make your reporting easy. With our SEO report template, no need to spend hours picking the right KPIs - it's all here! Just connect your sources, and you're good to go! Our comprehensive social media report template enables you to track the success of your campaigns in order to optimize your audience, targeting, and so much more.